By allegedly backing the Séléka rebels in early 2013, President Déby of Chad thought he could finally solve his southern problem. His plan backfired dramatically. 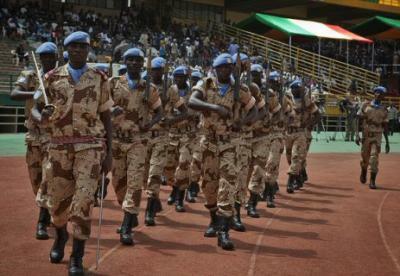 Chadian peacekeepers at the inaugration of Ibrahim Boubacar Keita in Mali. Photograph by MINUSMA/Marco Dormino. For those who keep an eye on goings-on in central Africa, it came as no surprise that the recent resignation of Michel Djotodia, the Central African Republic’s (CAR) short-lived president, came during a regional summit in Chad. As if the extent of Chad’s involvement in its southern neighbour wasn’t already apparent, the country had also managed to summon the CAR’s entire transitional parliament to N’Djamena, Chad’s capital, ahead of Djotodia’s announcement. Having influence, however, doesn’t mean things will always go your way, and in a sense, Chad has some responsibility in the crisis that has unfolded in the CAR. A year ago, Chad is believed to have given tacit approval to the Séléka rebel alliance − then led by Djotodia − as they embarked on a second push towards Bangui. A number of irregular Chadian soldiers and former Chadian rebels are understood to have been among their ranks, and the Séléka eventually overthrew President François Bozizé. Since then, the situation in the CAR has turned out much worse than anyone could have anticipated at the time. Though it ended on difficult note, 2013 had started well for Chad with its swift response to France’s call for help in tackling Islamist militants in northern Mali. Around 2,000 Chadian soldiers were sent to Kidal, where their combat experience in the deserts of eastern Chad was invaluable. While northern Mali is far from fully pacified, France’s Operation Serval has been broadly seen as a success, and the jewel in the crown was Chad’s claim that they had killed one of al-Qaeda in the Islamic Maghreb’s key commanders, Abou Zeid. Chad’s sacrifice in Mali – which included the deaths of over 30 soldiers – was perhaps not as well rewarded as President Idriss Déby Itno would have hoped; the command for the UN’s Mali mission (MINUSMA) was given to a Rwandan general rather than a Chadian one. Nevertheless, France, which has around 1,000 soldiers in the Chadian cities of N’Djamena and Abéché as part of its ongoing military presence in the country − known as Operation Épervier − was grateful, and reportedly sent teams to Faya-Largeau in the north of Chad to look for ways to secure the Libyan border. However, it was to events south of Chad, where the CAR was quietly disintegrating, that attention would soon turn. Chad and the CAR have a long history of involvement, dating back to the 1980s when Libyan forces used bases near the CAR-Chadian border from which to launch attacks against Hissène Habré, Chad’s dictator at the time. More recently, President Déby was involved in the installation of François Bozizé in 2003, giving the renegade general sanctuary during his campaign against then-president Ange-Félix Patassé. And even more recently, Déby made the significant move of withdrawing his support of Bozizé. Déby shows few signs of stepping back from involvement any time soon. “With the fall of Gaddafi, Chad’s Idriss Déby has become the regional kingmaker and shows no sign of leaving CAR alone,” writes Keith Somerville, Senior Research Fellow at the Institute of Commonwealth Studies. One reason for Chad’s interest in its neighbour is the continued activity of Chadian rebels in northern CAR. Many who took part in the attacks from 2008 to 2010 on N’Djamena and Abéché sought shelter in the north-west of the CAR, which was virtually untouched by Bangui’s authority. Here they mixed with Central African rebel groups, many of which later joined the Séléka coalition, and which have been operating in the Bria diamond-producing region for many years. One reading of Déby’s decision to back the Séléka over his former protégé Bozizé is that the Chadian president was emboldened by his foreign policy success in Mali and wanted to put an end to the constant rebellions in the CAR. According to a UN security adviser in N’Djamena, it seemed Déby calculated that his former rebel opponents could be drawn into Séléka’s fight, pulling them away from Chadian territory. It now seems clear that decision to switch allegiance to Séléka was “indeed a miscalculation” as Roland Marchal, a Chad expert at Sciences-Po University in Paris, puts it, adding that it is not clear who among Déby’s inner circle actually made the decision. There are further costs associated with Déby’s decision to allow Chadian soldiers to move unofficially into the CAR early last year to join the rebels. Indiscipline by Chadian soldiers comprises the reputation of the country’s military and has exposed the limits of Chad’s foreign policy being exercised through its army. In December, hundreds of Central Africans gathered at the airport to call for Djotodia and the Chadian contingent of the African Union peacekeeping force (MISCA) to leave, accusing the Chadians of supporting the Séléka. The Chadian response was to open fire, killing one person. And a few days later there were reports of Chadian soldiers fighting Burundian peacekeepers in the MISCA barracks. “Important questions have been raised about the actual quality of the chain of command within the Chadian contingent,” says Marchal. Déby’s bottom line has always been survival. He came to power through a desert rebellion 23 years ago and is acutely aware that he may leave power in a similar manner. Rather than ending instability, however, his decision to tacitly support the Séléka has made the situation on Chad’s southern border worse than ever. The country is now faced with thousands of displaced citizens − some of them Chadians who had lived in the CAR for years, trying to get home − and the prospect of recriminations and violence across the border for months to come. Correction 29/01/14: The third paragraph of the section “A history of involvement” originally stated that Libya established bases in the CAR near the Chadian border to attack Chad in the 1970s. But, while bases were established in the 1970s, they were not used until the 1980s to attack Habré ruled Chad. This has now been corrected.